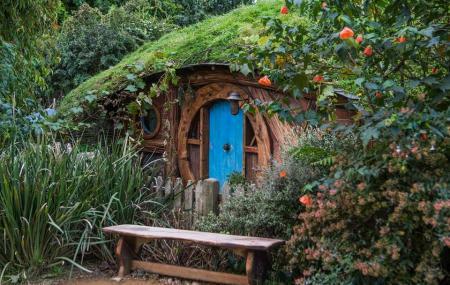 If you are a Hobbit Trilogy fan and have always wished to visit the place where the Shire scenes were shot, plan a visit to the Hobbiton (matamata). Basically a sheep rearing farm, the Hobbiton (matamata) is now equipped with lush greenery and landscaped garden as well as gift shop, cafeteria and inn. The Alexander family Sheep Farm looks magnificent with the backdrop of the Kaimai Mountain range. The guide will show you around by pointing out the detailing of the set and explaining you about the shooting of the movie. Around the set you will also find the Hobbit Holes, Green Dragon Inn and the Mill. Enjoy the Southfarthing beverage or a lavish buffet lunch at the Marquee. How popular is Hobbiton (matamata)? People normally club together Hobbiton and Matamata Glider Airport while planning their visit to Hobbiton (matamata). Incredible, like stepping into another world! Staff are well informed and very friendly! Awesome grabbing something to drink at the Inn! You will fall in love with this place even if you were not a geek (self proclaimed or not!). Went for a visit on a rainy day, but it didn't made the trip bad in the slightest. The lands are lush, the Hobbit holes are adorable, and the weather turned out alright. A bit chilly, yes. We had a friendly guide, Aaron (? ), and he gave us a great tour. Will surely visit here again when it's not raining!